Houston, TX. — August 20, 2018 — At Congressman Gene Green’s monthly safety meeting Houston Patrolman Officer Kenneth Miles gave the July Crime Report for the Houston North Channel and IH 10 East corridor area. Songwood subdivision area, according to Officer Miles, had 3 home burglaries, 1 burglary of a business, 12 vehicles stolen, 20 vehicles broken into, 2 robberies, 10 thefts, 8 aggravated assaults, 1 sexual assault and 1 arson case. Miles said the IH 10 East Freeway corridor (feeders) had 9 home burglaries, 10 burglaries of a business, 17 vehicles stolen, 30 vehicles broken into, 16 robberies, 34 thefts and 18 aggravated assaults. Melody Galland and Maria Pilar Aponte, P. E. engineers with the Texas Department of Transportation (TXDOT), gave an update on the plans for the FM 526 (Maxey Road) pedestrian-bicycle sidewalk plans which will connect Woodforest Boulevard south to IH 10. 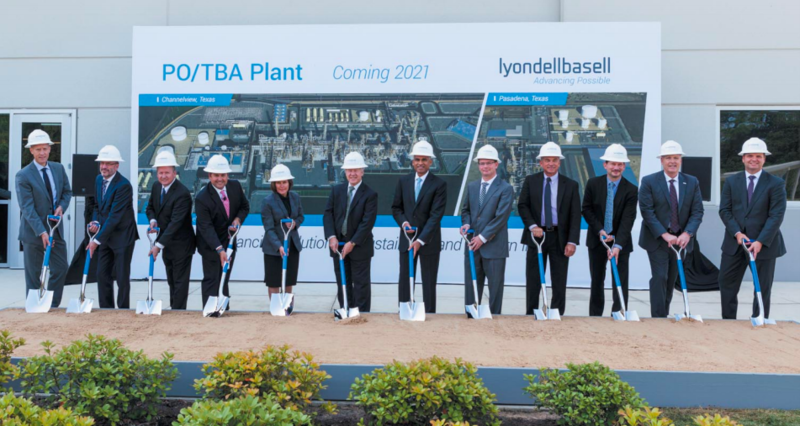 HOUSTON — August 22, 2018 — LyondellBasell (NYSE: LYB), one of the world’s largest plastics, chemicals and refining companies, today officially broke ground on what will be the largest propylene oxide (PO) and tertiary butyl alcohol (TBA) plant ever built. The Houston area project is estimated to cost $2.4 billion, representing the single-largest capital investment in the company’s history. Once in operation, the plant will produce 1 billion pounds (470,000 metric tons) of PO and 2.2 billion pounds (1 million metric tons) of TBA annually. Startup of the plant is planned for 2021. HARRIS COUNTY – Voters overwhelmingly approved a $2.5 Billion dollar bond proposal, that will result in 237 projects to mitigate future flood dangers in the county. With 98% of the votes counted, District Clerk Stan Stanart reported that the bond issue passed with 85% approval, or about 129,000 votes. Opposing the proposal were 15% of the voters who turned out, about 21,000. Votes were almost evenly split between Absentee, Early, and Election Day votes. Election Day was August 25th, the one year anniversary of the landfall of Hurricane Harvey onto the Texas coast. The bond issue includes 237 projects, $1.2 Billion for channel improvements, $12.5 Million for floodplain mapping, and $1.25 Million for an early warning system. This building at 15101 I-10 East Frontage Road, now houses about 200 immigrant children most of whom crossed into the U.S. without their parents. The building was formerly the Kindred Hospital, and before that the East Department of the East Houston Hospital. It has been run by Southwest Key Programs as a shelter for undocumented children for several years. Last week Congressman Gene Green toured the facility, to learn how the children are being cared for, and how federal dollars are being spent. 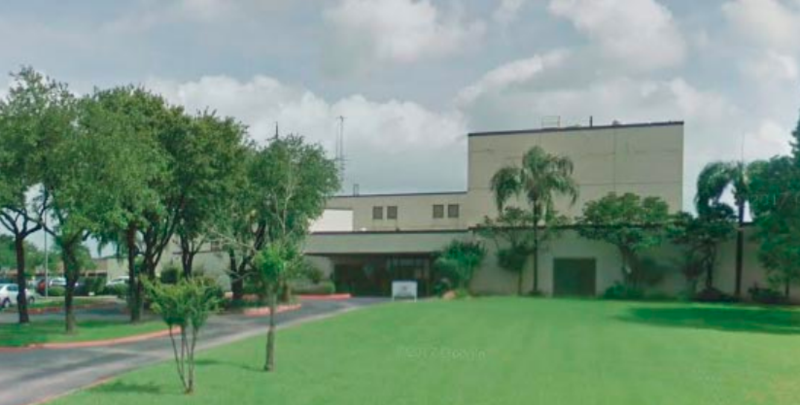 NORTH SHORE – Sitting anonymously along the feeder road at I-10 near Beltway 8, a three story building that was once a hospital now houses over 200 children that are unaccompanied immigrants. In most cases, these young people were apprehended at the Mexican border, and detained by U.S. authorities until their disposition. This could be sending them back to their own country, or finding adult sponsors in the U.S.
On Monday, August 20 Congressman Gene Green, accompanied by State Senator Sylvia Garcia and State Representative Ana Hernandez, made an inspection tour of the facility. Green told this newspaper that he had a difficult time getting access, even though the federal government is paying for the program that supervises the children. In an earlier foray, Garcia and Hernandez had been refused admission, and blocked by armed guards from entry, as reported in this newspaper. Green said that the Southwest Key Program group, that runs the shelter, required two weeks notice and vetted those who wanted to go on the tour. All three legislators wanted to see the facility and talked with the children, because the building is in their district, and they are ultimately responsible for its financing. Green explained to this newspaper that the program is administered by the U. S. HHS, or Housing and Human Services administration, and Southwest Key and other groups contract with the government to care for the children until their situation can be resolved. Houston, TX. – Monday, August 20, 2018 — Citizens from the North Channel area came to Congressman Green’s regular monthly community meeting to report their concerns about problem conditions in their neighborhoods. Crime conditions, flooding, littering, weeds and public nuisances are an ongoing monthly concern citizen’s report. Citizens were eager to give praise and thanks to the agencies representatives for taking care of their complaints. Green always has guests from governmental agencies present who’ll take notes of the citizen’s issues and then try to resolve the problems and report back their remedies from the issues reported at the previous community meeting. To help promote his 23rd annual immunization event in his district Congressman Green was the first of many present to receive his shots. For event locations and times or the next Community Meeting location and date, call 713-330-0761 or 281-999-5879. This year’s general election, set for November 6, will see a change in the Justice of the Peace in Baytown’s Pct. 3 Position 2. This is the position currently held by Judge Don Coffey. Marketing Executive Lucia Bates, a life-long resident of the North Shore area, will become the next JP in that jurisdiction, since she is running with no opponent on the Republican ticket. 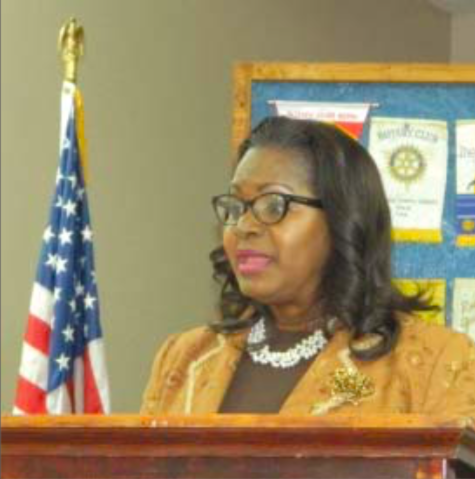 Bates spoke about her life and qualifications at a recent luncheon held by the Highlands Rotary Club. Rotary has had a special relationship with all the JP’s in recent years, Tony Polumbo, Mike Parrott, Don Coffey, and Joe Stephens. It was only natural that they wanted to meet and greet the next JP, Lucia Bates. She spoke having been born in the Carribean island of St. Lucia, and moving to the U.S. as a child. She originally worked for GTE in Baytown, so she knows the area well. After that, she moved into advertising and marketing, first for the Houston Chronicle, and later for Houston Community Newspapers. She currently has her own business, LB Marketing Solutions. In many of these positions, she has won awards for outstanding performance. Bates said her motivation to be a judge came from her passion to give back to the community. Her resume is full of public service positions, as a Rotary director, Chair of the North Channel Chamber, president of her HOA, and former board members of the YMCA, Pilot Club, Top Ladies of Distinction, Advisory Panel to LyondellEquistar, and much more. Jacinto City, TX. 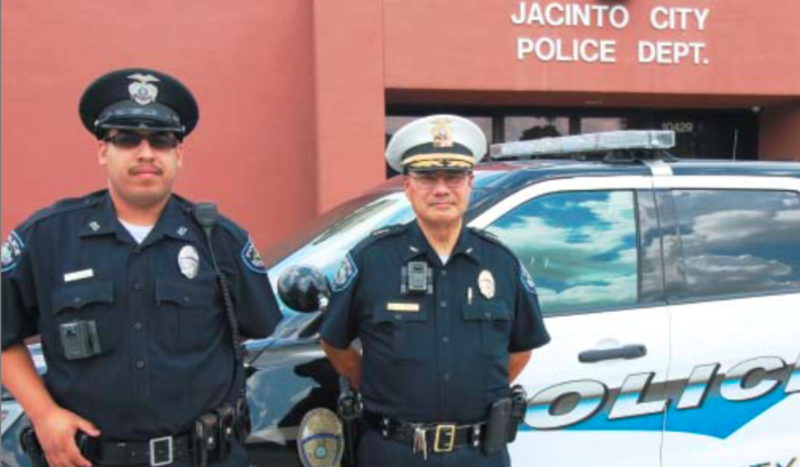 — August 9, 2018 — The Jacinto City Council approved the hiring of Samuel Omar Lopez as a full-time patrol officer. Officer Lopez graduated from HISD’s Furr High School and obtained his law enforcement qualifications from the Houston Community College Police Academy. His desire is to make a career with the Jacinto City Police Department. Beto O’Rourke and Adrian Garcia at the Channelview Town Hall. Many politicians were present for the event, including Pct. 2 Commissioner’s candidate Garcia, County Judge candidate Lina Hidalgo, JP candidate Lucia Bates, and many others. Garcia gave the warm-up introduction for Beto in his usually warm and friendly manner. 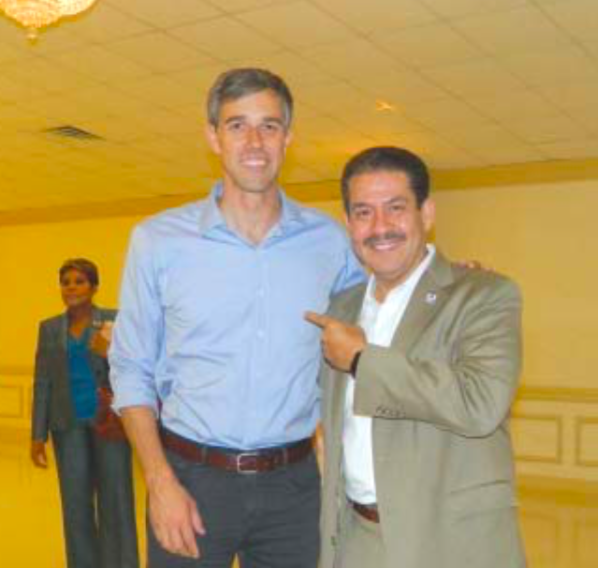 CHANNELVIEW – Candidate for Texas Senator Beto O’Rourke held a Town Hall meeting last Tuesday, at Armenta’s Reception Hall. Hundreds of supporters, and the curious, turned out for a warm greeting. O’Rourke is on a 34-day grassroots drive across Texas, and Channelview was one of his few stops in this area. Beto has made a point of visiting all of the 254 counties in the state. Although the crowd was mostly Democrats, many of them wearing “Beto for Texas” tee shirts, there were also some Republicans and Independents who tolds the North Channel Star they admired the man and message that Beto represents. Beto gave a fiery speech, animated with arms waving, about his position on Veterans’ rights, public education, better pay for teachers, and universal healthcare. Beto noted that his campaign is funded entirely by individuals, and not PACs or special interests, in contrast to his opponent, incumbent Senator Ted Cruz. O’Rourke said that so far he has raised more than $10.4 million dollars for his campaign, almost twice what Cruz raised. In addition, polls are now showing that he is within 4 points of potential votes, with the latest being a poll taken by NBC news. The poll gave Beto 45% of the vote, with 49% for Cruz, and 6% undecided. Beto claims that as the general election in November approaches, he will pick up the difference. 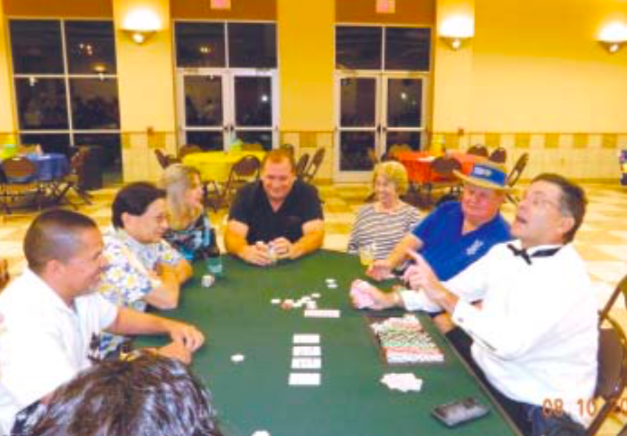 Namesake Bill Palko, at the table far right, kept an eye on the money all evening and had some fun playing. 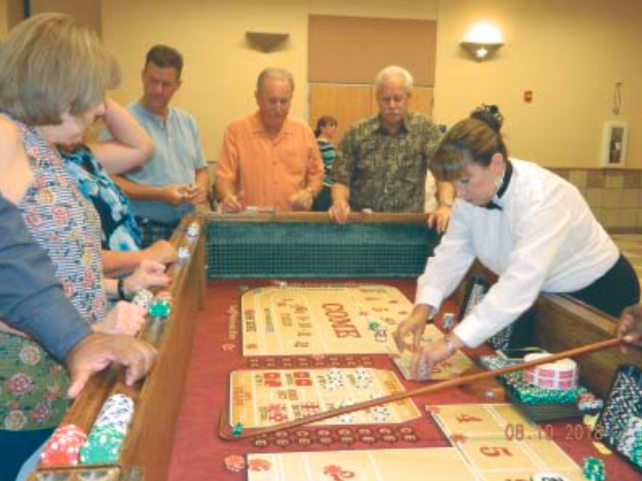 Town Center in Jacinto City resembled Las Vegas last Friday night, as the North Channel Chamber Foundation held their Casino Night fundraiser. Almost a hundred funseekers turned out for an evening of casino games, and good food from Pizzinis. Games included craps, blackjack, poker, and roulette, all played with “funny money” in the thousands. The Title Sponsor was Bestway Oilfield, and Corporate sponsors included Arkema, Amegy Bank, Community Toyota, HCA Houston ER, North Shore Rotary, San Jacinto Colleg Foundation, Top Dog Fireworks, Woodforest Bank, United Community Credit Union, and Alamo Ready Mix. Proceeds from the evening will go to the William C. Palko Scholarship fund. The evening also included a silent auction, and a raffle. Guests for the evening included North Shore Rotarians, Chamber members, and sponsors. Poker was one of the popular games of the evening, as Rotary president Bill Bowes (in hat) checks his cards. Jacinto City – On Thursday, July 26, 2018, City Manager Lon Squyres presented to City Council the flood prevention project he’s been promoting for the city with the Harris County Flood Control District (HCFCD) should the 2.5 billion Bond Election pass. 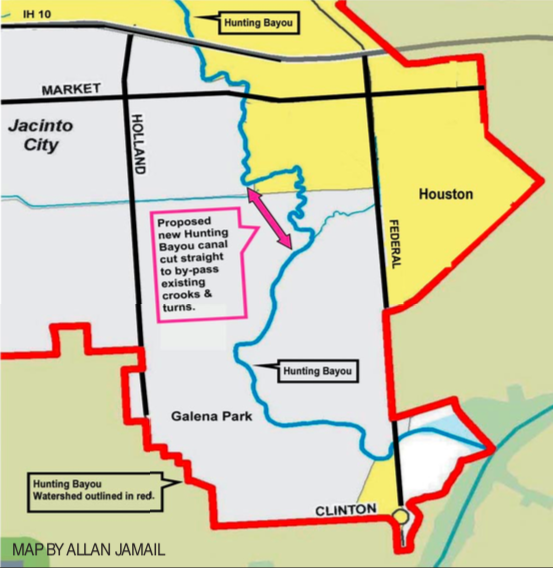 By implementing the HCFCD list of proposed projects for Hunting Bayou upstream of Jacinto City Squyres said it stands to reason that if those improvements are made it will cause an increase of water to flow downstream more than ever before, causing even more flooding in Jacinto City. Flood control projects are required by law to show zero negative impact to upstream or downstream areas. The United States Army Corps of Engineers has announced funding for four projects: Brays Bayou, Clear Creek, Hunting Bayou and White Oak Bayou. All four projects have significant local funding match requirements. If the bonds are approved, these projects could start immediately. 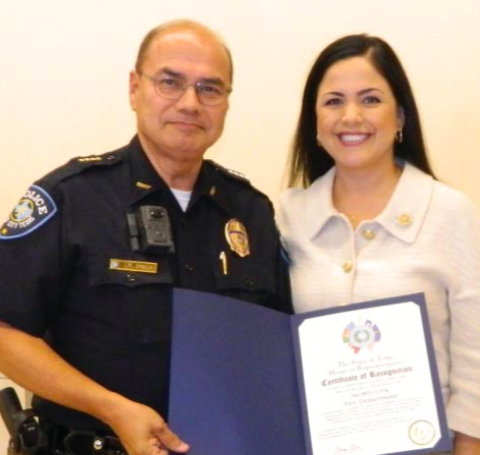 ANA HERNANDEZ PRESENTS JACINTO CITY POLICE CHIEF JOE AYALA WITH A CERTIFICATE OF RECOGNITION FROM THE STATE. The North Channel Chamber held their monthly luncheon last Friday, at the Jacinto City Town Center. Featured speaker was State Legislator Ana Hernandez, who represents District 143. She is also a practicing attorney with the firm Soto and Hernandez. Ms. Hernandez presentation was first about her life story, and then about issues she is concerned about that she will take to the next session of the State Legislature that starts in January 2019. She said that she was born in Mexico, and raised in Pasadena. Her parents were undocumented, giving her a special interest in this issue. She was educated at the University of Houston, and the UT School of Law. Ms. Hernandez was first elected in December 2005, and represents parts of Houston, Channelview, Galena Park and Jacinto City.